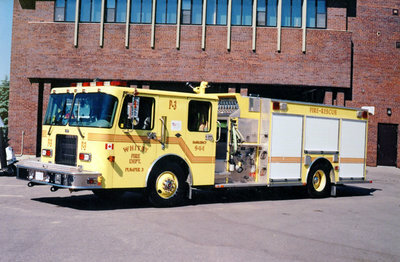 A colour photograph of a 1997 Spartan Advantage pumper truck (Pumper 3) owned by Whitby Fire and Emergency Services. It is positioned in front of Whitby Fire Station No. 3 at 201 Brock Street South. This station is now closed. 1997 Spartan Advantage Pumper Truck, June 20, 2002, Dean Nickerson. Whitby Archives A2013_020_007.